You just won $10,000 a month. That’ll get any nonprofit marketers attention, right? 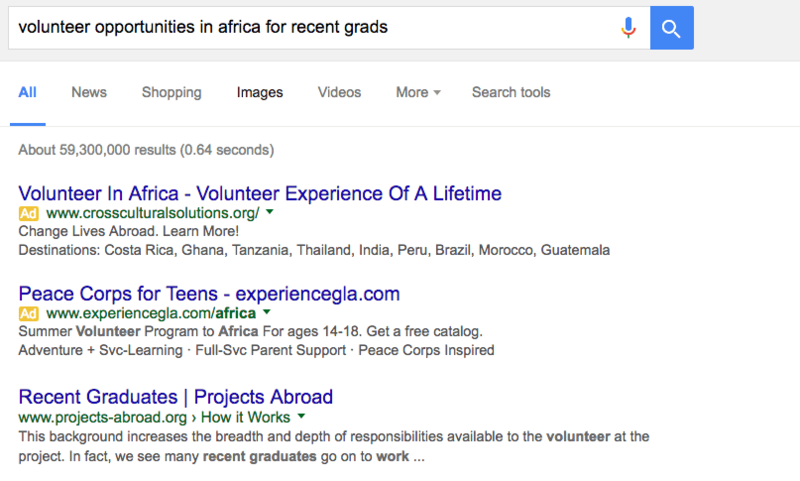 If you haven’t received your $10,000 a month from Google Ad Grants for nonprofits, read this NOW to learn more about why AdWords is so helpful to nonprofits and to see if you qualify. If you know you qualify for you $10,000 grant, but you’re struggling to set up a successful first Google AdWords campaign, the time is now. Follow our lead to increase your website traffic and conversions through quality Google Ads. Your ad should be created with a specific goal in mind. Rather than simply trying to drive traffic to your site, choose a landing page, donation page, or event to promote. Seeing as Google is flooded with traffic daily, you have to really hone in on your audience and how you will draw them in. AdWords works best with specifics: drawing in the right people at the right time. This will also help you with your keyword selection in the next step. Example: Say your nonprofit helps to provide medical services in Nigeria. You want people to find your website and inquire about how this works. Your goal is for volunteers to fill out the Contact Us form on your volunteer landing page. Once you’ve established your goal, take time to really flush out who you’re targeting. In most cases, the more specific you can get the better. Read through our audience persona guide if you want help determining your audience. Example: Luke is a recent college grad (22 years old) from the University of MN and doesn’t quite know what to do before med school. He’d like to volunteer and feel like he’s really contributing to something. He’s heard of several services that set you up with a volunteer program in Africa, but he can’t tell which one will work for him. Most days, he goes online later in the evening, after dinner. He uses Google and LinkedIn when looking for career-oriented opportunities. 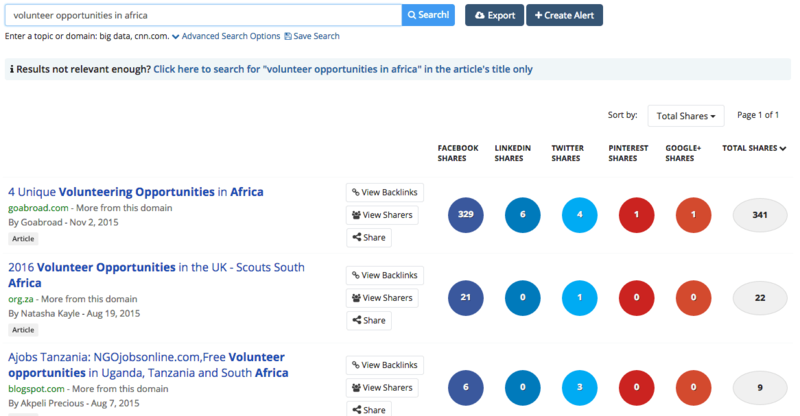 – Buzzsumo: This site will show you what is trending around your key phrase. If you type in your subject matter, it will show you other online content that is receiving attention. You can take this and study what language they use to help you understand what works. 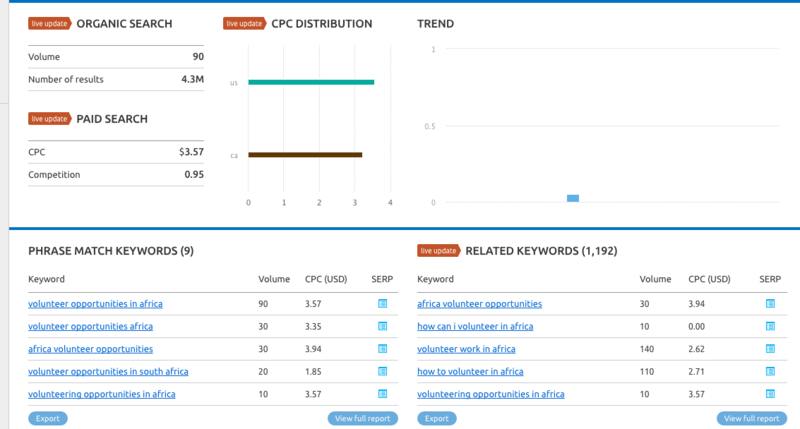 – Semrush: This tool is insightful for understanding the volume of searches surrounding a key phrase. It will help you know how often your phrase might be searched or how you can reword your phrase in order to match it with what searchers are actually typing. – Google Search: Type in various searches to Google, first studying auto-fill to determine common searches. Then study the actual search results to see how your competitors are coming up. You can see in the example below the first couple search results are ranking through AdWords. Example: With Luke in mind, we will try to think like he would. What would he type into Google Search and how would he phrase it? Think through this while you perform a competitive analysis of keywords. a) There is a monthly budget of $10,000 or $329 per day. 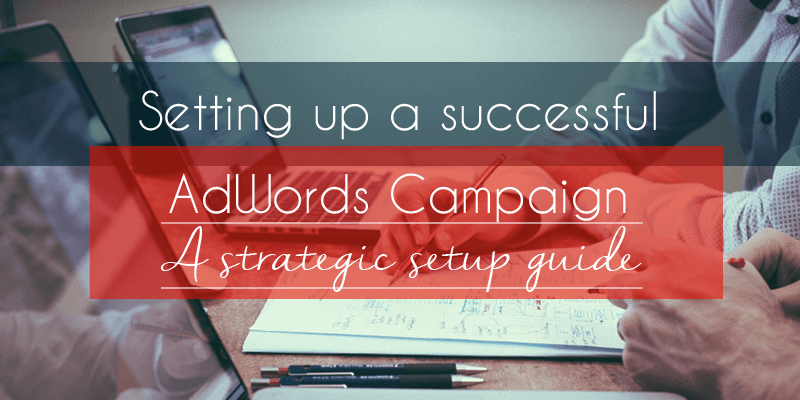 Knowing this, you’ll really want to study how your campaign is performing as you go. For example, you’ll want to set your ad to show up at the right time of day so you don’t run out of budget too early, before your audience is even online, but you won’t be able to tell this until you see how it performs. b) The maximum cost-per-click (CPC) limit is $2.00. This means that for more competitive keywords, you probably won’t show up since you can’t bid more than other organizations. Find more specific keywords for which others aren’t competing as much. If you have a key phrase you want to be sure to rank for, but it will cost you more than $2.00 CPC, consider investing some of your nonprofit budget for that campaign. This means you cannot specify based on location, language, device or audience targeting within your account settings. Use the strategizing you did to inform your keyword selection. This means display, video & remarketing campaigns are not part of the program at this time. Use this to your benefit by really focusing on how text ads work specifically. If you think display, video and remarketing is essential to your nonprofit, consider investing to run those campaigns as paid ads. You’ll want an Ad that calls users to action. Incorporate the key phrase you came up with earlier and be specific regarding what you’re asking them to do. Note the tight character limit. Get as specific as you can within the character limit. Use action-oriented verbiage. Check in as often as you can manage. You’ll want to a/b test your ads, specify negative keywords and target more audiences. Contact ArcStone for a free AdWords audit or help setting up your account.